When declaring an unfalsifiable theory in this case planet evolution is pseudoscience. The amazing discoveries which have been found so far are a prime example. Evolution always sounds better in story format because one can come up with all kinds of conclusions which are not necessarily true or on the right path, but when it comes to direct observations it is falsified. New Horizons was also able to capture some amazing data of Pluto’s moons which also doesn’t agree with the assumption of billions of years old. Nix and Hydra have bright surfaces, this presents a major problem for the belief in billions of years old because there is a lot going on externally such as radiation darkening, the transfer of darker material from Charon via impacts, impacts with dark Kuiper Belt meteorites. The evidence suggests youth not old age. It will to be interesting the various stories they will come up with to try to preserve billions of years old that defy common sense. The conclusions to keep it so old is not science rather just a belief that they think needs to be preserve otherwise the rest of their theory in other areas of evolution go down too. Pluto is not 4.5 billion years old! Neither are its moons! The new data coming in from New Horizons confirms the Bible more than planet evolution! When you have a small planet which is 3,670,050,000 miles away from a major heat source in this case the sun, the laws of Physics say that Pluto should lost its heat quicker than bigger planets which are closer to the sun. Moreover, heat sources are more restrictive on the dwarf planet (Pluto) such as radioactive elements depleting over time and when it is supposedly billions of years old. In other words, Pluto should not have active radioactive elements existing today. While Alan Stern says nobody predicted Pluto being Earth-like, creationists have predicted youthful activity on Pluto. Even on this blog, there have been comments on scientists discovering Pluto is not in agreement with their assumed age which confirms the Biblical account that the Universe was intelligently designed by a creator, namely God! We are living in exciting times when it comes to space exploration! As predicted in this blog, Pluto would contain youthful features, just like a pattern of other discoveries through out our solar system which doesn’t match the billions of years assumption. Now scientists have put an upper limit on age at 100 million years but this doesn’t mean that Pluto is 100 million years old. Calculating a lower limit is an ongoing project for them so it will be interesting to see what they come up with. 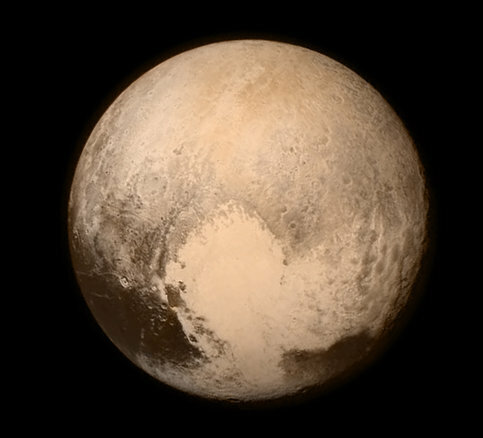 It is highly unlikely that secular scientists will give up on the notion that Pluto is billions of years old. Even millions of years old is a problem for planetary evolution. “The mountains seen, which are “quite spectacular,” are up to 11,000 feet high—incredibly tall for such a small body, rivaling the Sierra Nevada. 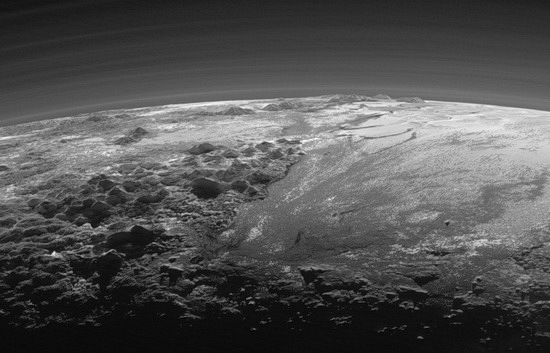 Spencer also says that Pluto’s mountains were not created out of nitrogen ice, methane ice or carbon dioxide ice. “You just can’t make mountains out of that stuff.” Spencer thinks we are looking at bedrock in the picture posted above. Tidal heating has been used in other discoveries as the source for powering recent geological activity in places like Enceladus whose geysers are still active. Because without a power source, it would be impossible for geological activity to sustain itself over the course of billions of years especially in cold space pretty far from the sun. Like Enceladus, Pluto also has young features on its surface. As predicted in my previous post, a team of secular scientists will be working on coming up with ideas on how Pluto could be billions of years old, and yet have a heat source that hasn’t frozen out yet despite it being small, with no chance of tidal heating, and is extremely far from the sun. In reality, their project of trying to fit it into billions of years (because that is what they believe not what the data is giving them) defies the laws of physics. Not to overlook Pluto’s moon Charon which is half the size of Pluto circles each other in gravitational lockstep every 6.4 days. It also has some young feature, confirmation of youth rather than billions of years old. After being under the gun to get the spacecraft built within a time frame that would cut the voyage to Pluto by four years, taking off in 2006, then traveling 9+ years in space over the course of more than 3 billion miles faster than any thing made before it, New Horizons makes history by exploring a planet never seen this close by mankind along with its five moons! Cheers erupted as New Horizons began to communicate with Earth again after being silent for 22 hours because it was programmed to be totally focused on collecting data of Pluto as it flew by! Currently, most of the data remains on the spacecraft and will take quite some time to transmit it all back to earth. 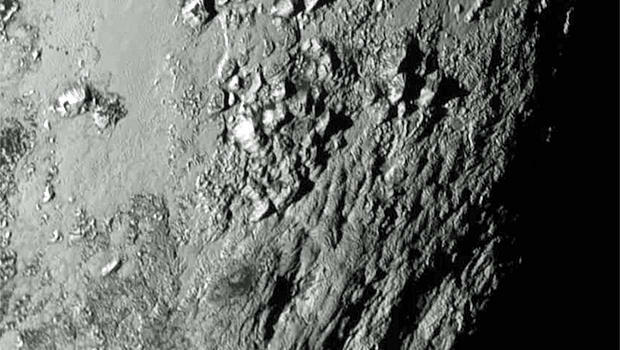 The highest resolution taken so far of Pluto will be released sometime on Wednesday. What an amazing day, what an amazing accomplishment with this intelligently designed spacecraft! More challenges may include once the data has been transmitted back to Earth: atmospheric escape rates of molecules are found to be too rapid to sustain for billions of years making a confirmation for a younger Pluto than what is believed among secular scientists. This will in turn create a team of planetary scientists who will work hard to come up with something which would put it back to billions of years. The measurements of Pluto’s atmosphere will be an interesting one especially for creationists. Another challenge that may present itself is…the data will not confirm the moons were formed by collision causing another team of scientists to come up with a way to preserve a popular idea using collision as a cause on how those moons had formed. Unlike Mars, they will be no search for life on Pluto, however, speculation may emerge about life on Pluto in its supposed very distant past, perhaps as a selling point to go to Pluto again. In any case, they don’t need to use a selling point like that, we ought to explore Pluto again, maybe next time send two probes: one that could go in orbit and another on the surface of Pluto!